You can easily downgrade your EasySendy Drip (or EasySendy Pro) subscription from higher to lower plan through EasySendy Drip (or EasySendy Pro) account from dashboard. 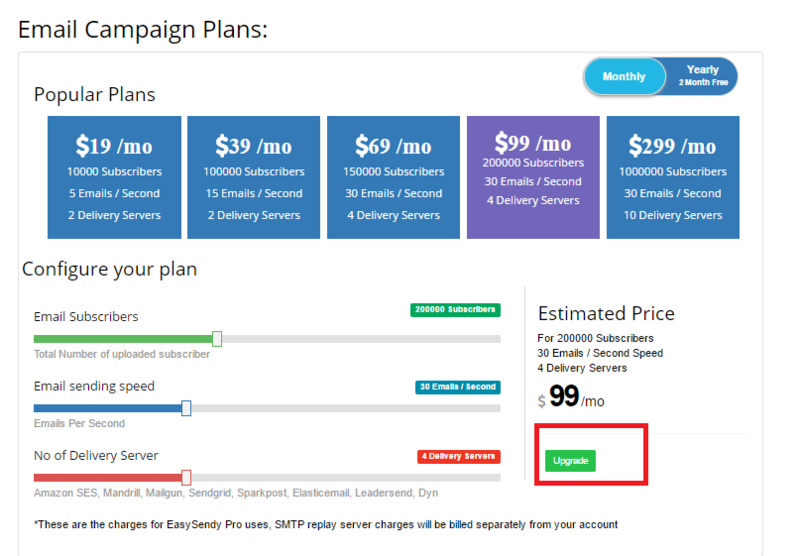 For this go to Price Plans from Right menu of EasySendy Drip (or EasySendy Pro) Dashboard. After that choose/ configure the new plan according to your new need to which you want to downgrade and click on “Upgarde” button, and finally make payment. After successful payment; your account will be downgraded instantly. PS: You will get error if you are downgrading from higher plan to lower plan; for this you will need to remove the extra added delivery server and email subscribers.